Oh my goodness! I read a LOT of books, obviously, for both Beading Arts and for Mixed Media Artist. And I really really like most of them. But it's been a long time since I have lavished so much time and attention on one book. 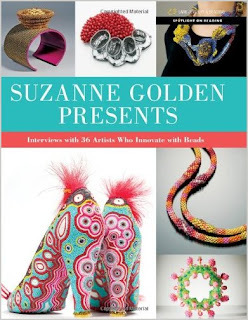 Suzanne Golden Presents: Interviews with 36 Artists Who Innovate with Beads is the first in a new series by Lark Books called "Spotlight on Beading". Some of these artists you will recognize; others I'm pretty certain you will never had heard of. The chosen artists are very heavy on seed beads, and I am now wondering if future volumes in this series will be covering other bead types more thoroughly. The only thing I can tell you for absolute sure is that you are going to want to see a copy of this book, or better yet, own one. If you get it from your library, you run the risk becoming a library thief! It was very difficult to choose favorites, because there are so many amazingly unique visions represented here. Under duress, I can point to Eva Maria Keiser's spectacular architectural beadworks, and Jeanette Ahlgren's lovely baskets full of light. As you gaze and read, you get a sense of the artist as well as the art. 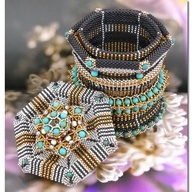 For example, Jeanette answers the typical "What's your favorite part of working with beads?" thus: "When the fourth side of a piece is finished." When asked, "How do you choose the beads you use? ", she quips: "I get lucky." A smart aleck after my own heart! Truly, this is a book you will not want to miss. Run, don't walk, to get a hold of a copy.